Count eighth-grader Sydney Lee among New Vision Academy’s many fans of academic growth data. Sydney was earning C’s and B’s in math and English until she was introduced to her own diagnostic assessment data by educators at 2015 SCORE Prize-winning middle school New Vision Academy (NVA). After challenging herself to put in more effort on daily assignments, Sydney has closed the gap between potential and performance. She’s now earning A’s in math and English. Teachers use data to inform lesson plans, so instruction is differentiated and targeted. While NVA has the small-school benefit of natural collaboration, teachers say the different data open lines of communication even further. The team works together to consider interim assessment results, what needs to be retaught, and how to improve mastery. 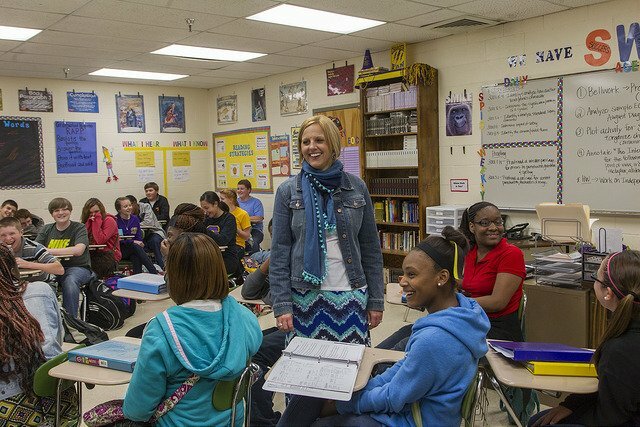 For English language arts teacher Sarah Leach, now in her second year at NVA, this atmosphere was initially intimidating. Over time, she realized that openness to feedback and honesty about her work helped her become a better teacher faster. Those who are achieving growth in their classrooms take turns leading instructional meetings, said Mr. Malone, and staff members are empowered to take on leadership roles. For example, a particularly hands-on science teacher with a strong subject matter background has been empowered to help train other science teachers and clarify standards, fueling NVA’s big science gains. ELA teacher Rosalie DeMasi is able to provide very specific student reading levels to teachers of other subjects. Science and social studies require heavy reading, and NVA English teachers watch for standards in other subjects requiring high levels of comprehension. Ms. DeMasi works to make sure students have tools to make complex texts more accessible. “We’re always looking for ways that we can help students across subject areas,” said Ms. DeMasi. Many students enter NVA classrooms two or three grade levels behind. NVA helps them close gaps – sometimes very quickly. NVA’s use of data helps kids understand their potential, identify goals, and demonstrate progress. Staff members talk openly and frequently with students about results, with many one-on-one meetings. Students always know exactly where they stand. And when students achieve growth, it’s celebrated. Quarterly school-wide festivities give the students something to aim for throughout the year. For example, kids who do well on the year’s first quarterly assessment – which falls right after Halloween – get free admission to NVA’s fall festival. Pizza parties and other in-classroom celebrations are used to reward meeting other goals. Student of the Week accolades recognize noteworthy effort, while students already achieving at high levels are honored with school leadership roles, helping complete peer interventions. Even small gains are celebrated in some way; high fives and encouragement in the hallways are common. Parents are introduced to the data as well, and educated about the differences between assessment results and course grades. The detailed information available helps the school break down for parents any specific changes that might need to happen – more attention paid in class, a need for tutoring, greater effort on homework assignments. Parents and teachers meet twice each year for conferences, but progress reports go home every two weeks while results of other assessments reach parents as soon as teachers have them. The approach is conducive to clear communication with a diverse group of parents, including families for whom English is not the first or only language. Busy caregivers might not have time to read every word sent home from school, but the color-coded diagnostic reports are clear and concise. While NVA has a clear focus on data and achievement, the staff balances this with continuous work on social and emotional learning. Teachers work to meet students’ needs holistically, building relationships and finding moments to talk about kindness and respect. The resulting atmosphere is very meaningful for NVA students, who say they feel safe at school. Peer friendships are nurtured, as are bonds between educators and their pupils. And teachers, who often have the same students in class for two consecutive years, say the impact of their work is concrete and visible.